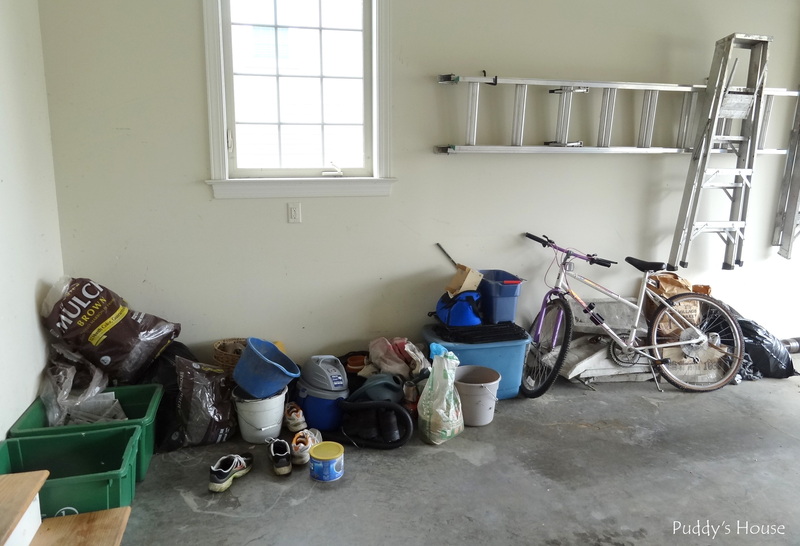 If you follow Puddy’s House on Facebook, you already saw the picture below which shows how bad the one corner of our garage looked. And, if you don’t follow along on Facebook, hop on over and like our page. 🙂 I plan to show more quick updates in real time at Puddy’s House on Facebook – I just gave a sneak peak of our new couch today. Over the winter, I was searching Pinterest for some inspiration, and I posted some of my finds here. 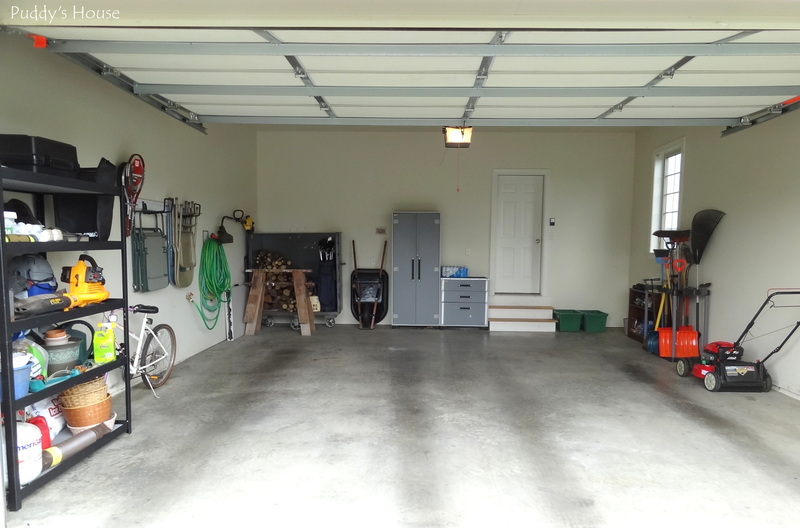 Our after pictures don’t quite look like the inspiration I found, but what the inspiration did help with was thinking through what would make sense for our garage and how it would be best organized for us. Now, back to some before pictures of our garage. It looked BAD! We have a little bit of everything stored in there. Fortunately, it is contained to around the perimeter because we do park both of our cars in the garage. So, we took stock of what needed organized and headed to Lowe’s to see what we could find. 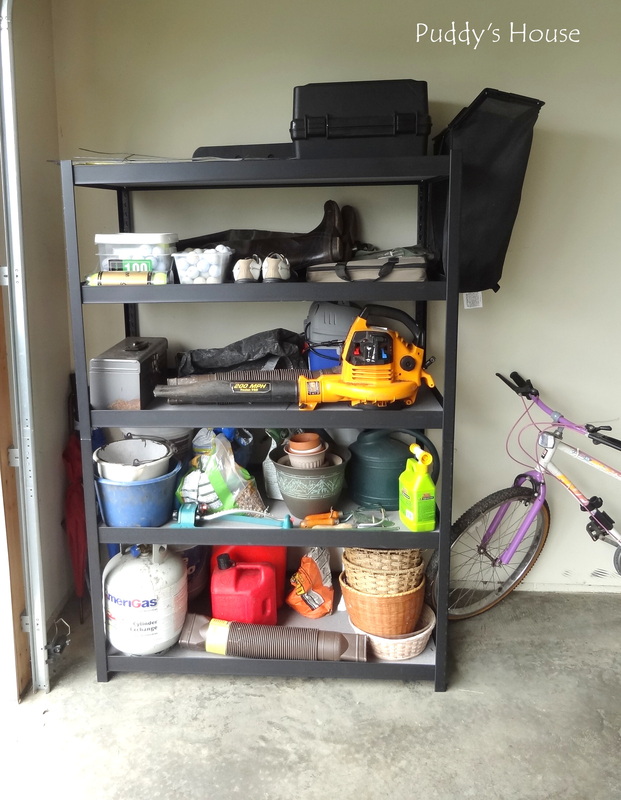 I already had those 2 short shelves in the picture above – I had gotten them free from work and figured we could use at least one of them in the garage. At Lowe’s we found a nice large shelf, 2′ x 4′, that we thought would help us out. And, the bonus was it was on sale for $79. We got the shelf put together and then we had to find the best spot for it. We moved the tool organizer from this spot and put the shelf in its place. The large shelf ended up housing most of the junk that had just been laying around. The empty propane tanks and gas cans live on the bottom shelf with some concrete mix, spouting and plant baskets. The second shelf has primarily gardening supplies. 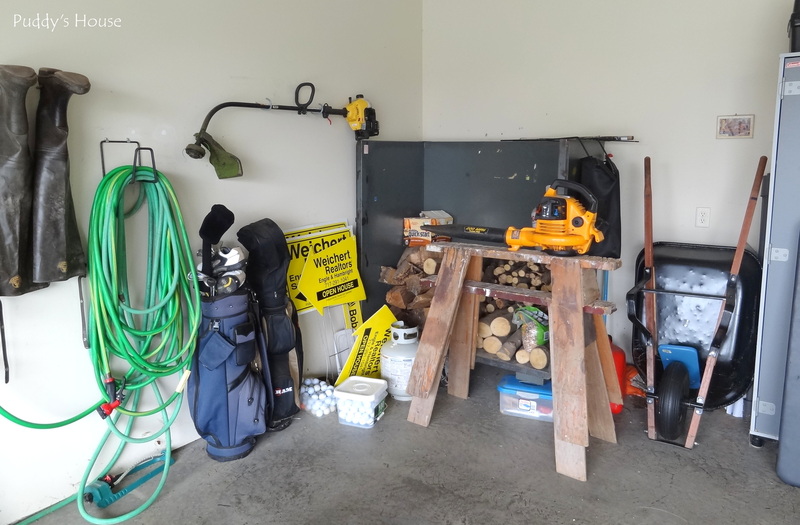 The third shelf up got some of the tools – the leaf blower, shop vac and extra tool box. The fourth shelf up has sporting goods: golf balls, fishing rods, fishing boots, tennis balls, etc. You can barely even see the real estate signs anymore; they are laying flat on the top shelf, which also houses the chain saw. The shelf worked well for us and is rated for plenty of weight. Not much else remains on the left side. The bike is still there, but only because we couldn’t find a ceiling or wall mount for it at Lowe’s. That is still on our to-do list, but for now it is not in the way. 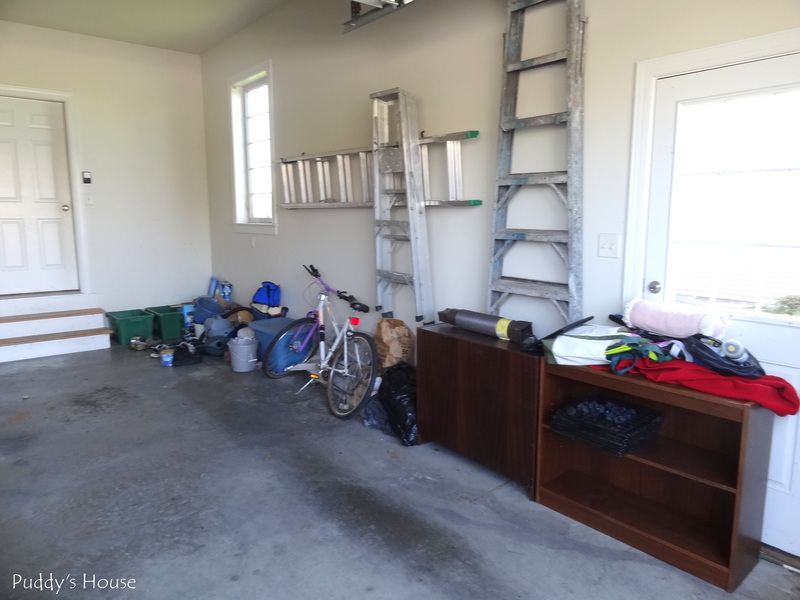 We already had the hanging racks for the chairs, tennis rackets, hoses, and weed eater. The other area that really got cleaned up on that side was the front. 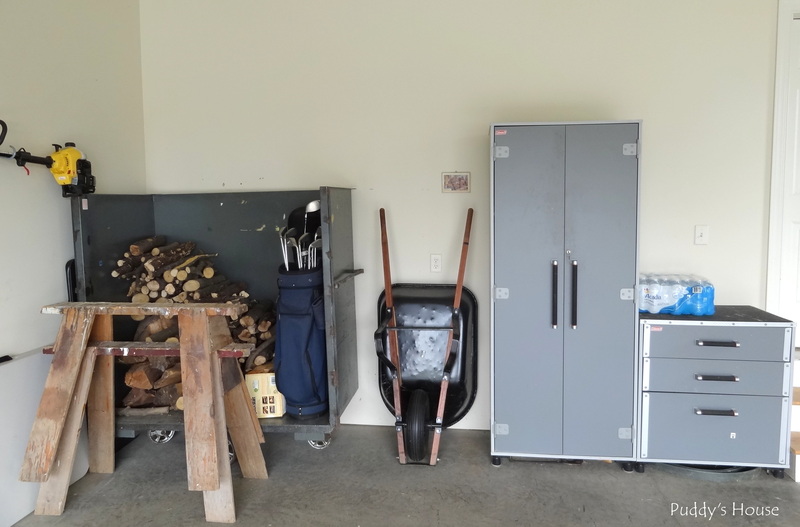 We stacked the firewood better and created a bit of a separator so that we could store both of our sets of golf clubs on the metal shelf. The spare folding tables got tucked between the cabinet and the wall. All of this freed up the space around the wheelbarrow so that it is easily accessible when we need it. I did some minor organizing inside the cabinets, but they were in pretty decent shape when we started. We keep the car cleaning supplies, tiki supplies, tools, extension cords, saws, and other flammables in the large cabinet. The short cabinet has nails, screws, caulk, and painting supplies. 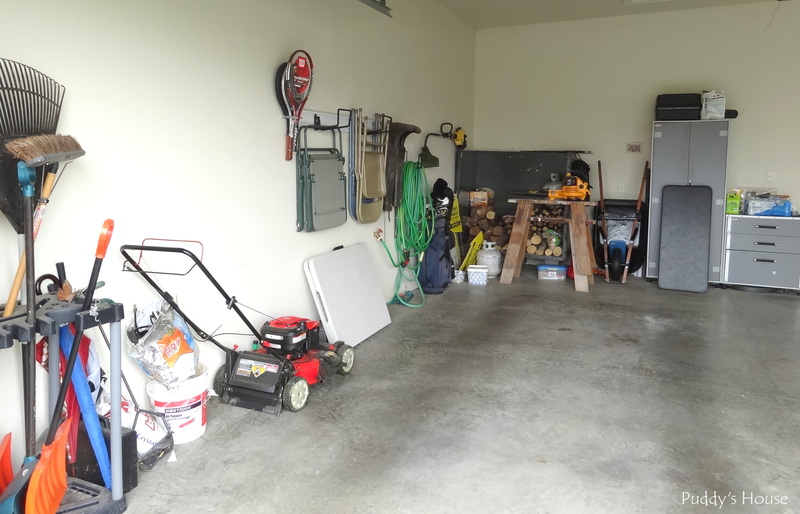 The other side of the garage had a decent amount of work and reorganization too. 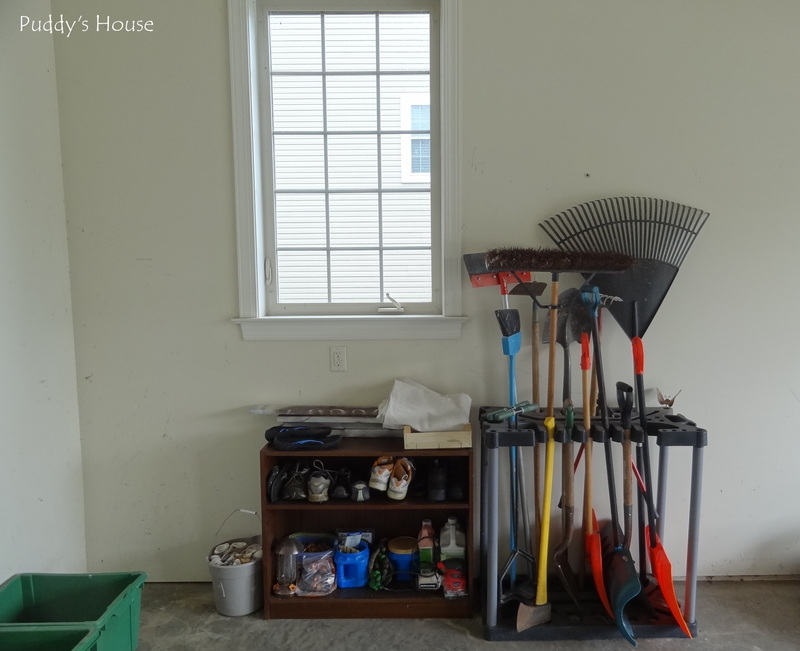 The yard tool organizer moved to this side. And, we used one of the freebie shelves to organize our variety of shoes, as well as some of my DIY supplies. I keep spare boards, a drop cloth, sander, stripping supplies on these shelves now. Its nice to know where it is, and this is also so that the mouse outside can’t get to my drop cloth again. The ladders used to take up pretty much the whole wall, but when we thought about it, we realized we could hang them vertically and minimize the space they took up. 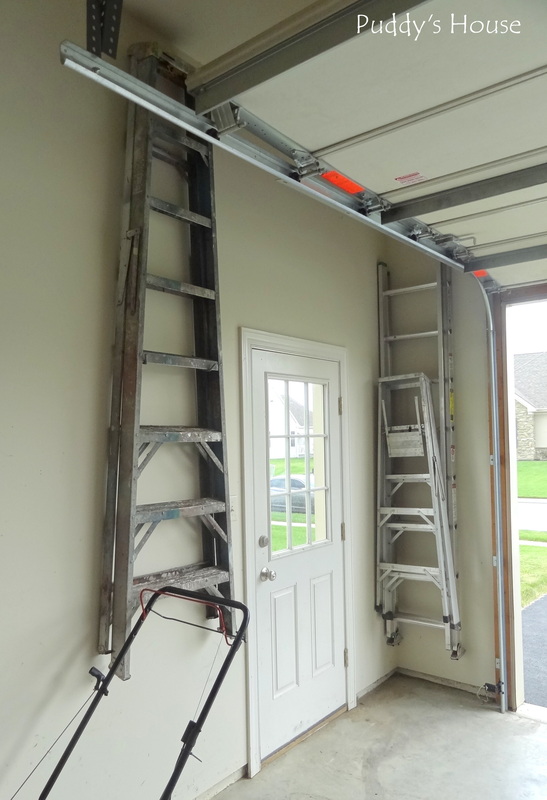 It was nice to tuck two of the ladders into the little useless corner by the side door. 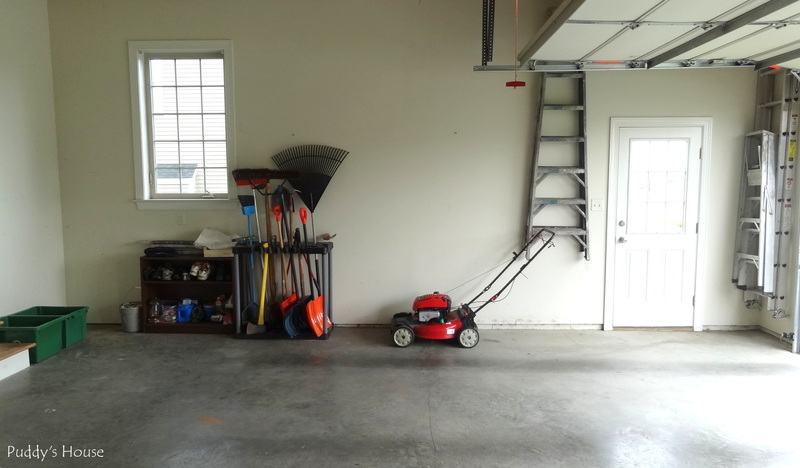 So, overall we only spent $79 and have an organized garage that Bob and I both are very pleased with the results. We can both get in and out of our cars easily and we also know where everything is supposed to be stored now too. 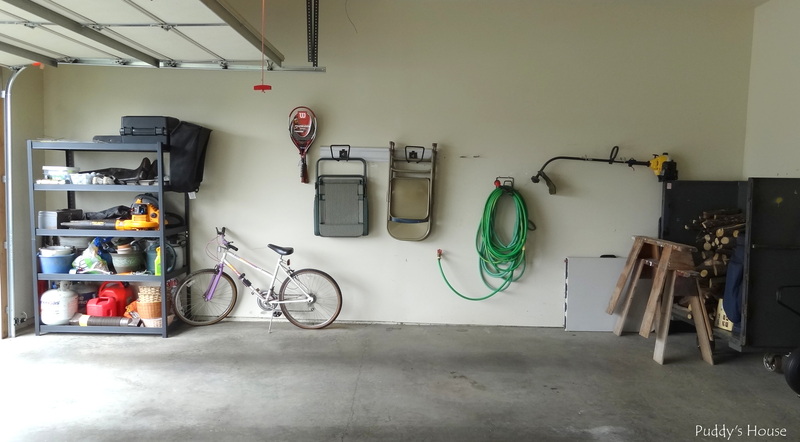 Is your garage organized? What do you store in there? Any good organization tips or tricks to share?